John Lennon's famous Gibson J-160E acoustic guitar. A John Lennon guitar is going up for auction -- the one he played when he wrote the Beatles number: "I Want to Hold Your Hand." 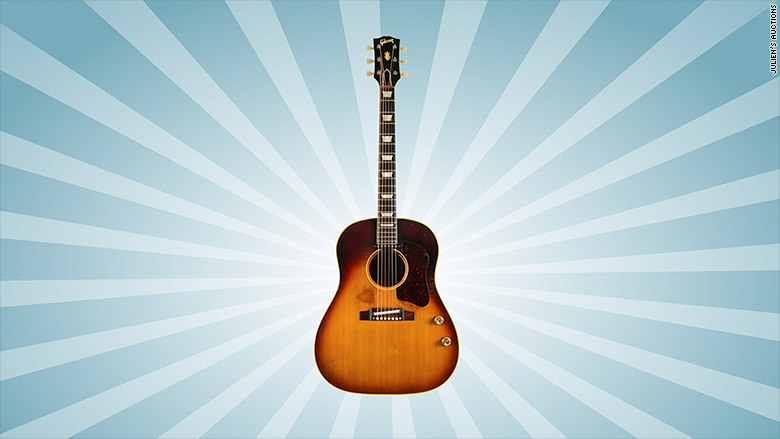 The Gibson J-160E acoustic guitar is expected to sell for up to $800,000 when it hits the auction block in November, according to Julien's Auctions, which specializes in entertainment memorabilia. Lennon and fellow Beatle George Harrison both bought the same style Gibson guitars in 1962 at a music shop in Liverpool for £161, or about $245 at today's exchange rate. According to the auctioneer, Lennon also used the guitar while recording some of the Beatle's early songs, such as "P.S. I Love You" and "Love Me Do." He played it during live performances and the guitar can be seen in a video of the band from 1963. Lennon also used the guitar to co-write some of the Beatle's biggest hits with Paul McCartney, including "She Loves You" and "All My Loving." Lennon's Gibson went missing about a year after he bought it and was considered lost for 50 years. The guitar's current owner is a San Diego man named John McCaw, an amateur guitarist who bought it second hand in the 1970s, said Martin Nolan, executive director at Julien's Auctions. "He had no idea he was sitting on a hidden treasure," said Nolan. Nolan says it's unclear how the guitar ended up in California. But he said the auction house has been working for months to verify that the guitar is authentic. It was identified last year by Andy Babiuk, an author and expert on instruments used by the Beatles. Babiuk said in a statement that he was able to match the wood grain in the spruce top of the guitar to photos of the one Lennon played. Also, the serial number matches the original receipt and the guitar has a one of a kind pick guard. "It is without a doubt one of the most historically important guitars to ever come up for auction," said Babiuk. Other Beatles guitars have gone for six figure sums in the past. Last year, a 1962 Rickenbacker 425 guitar used by Harrison sold at Julien's for more than $600,000. One of the most expensive guitars ever sold was Eric Clapton's Fender Stratocaster known as "Blackie," which went for $959,500 at auction in 2004. But not all rock star guitars sell for big bucks. A Stratocaster played by Jimi Hendrix reportedly sold for just $320,000 in April. It was expected to fetch up to $800,000.